What exactly is margin and how does a margin account work? Put simply, a margin account is a brokerage account where credit is extended to you by a securities broker for the purposes of purchasing assets such as stocks, bonds, options, ETFs and other "marginable" securities. In essence, the broker loans you money to buy (or sell short) an asset. This is known as "buying on margin". So, why would you as an investor want to use margin? The main reason is to increase your exposure to the market. This translates into much greater potential for upside profits should your investments perform well. The flip side of this of course is that you could incur a much larger loss should the investment perform poorly. As with any loan, you will be charged a financing fee. This fee will be quoted by most brokers as a percent interest rate spread over a benchmark interest rate (say, 1.5% over the Fed Funds rate for example). While the spread differs from broker to broker, it usually falls within the range of one to five percent (which is actually quite low relative to many other types of loans such as credit card debt). And guess what? You won't even be required to undergo a credit check! In order to offer such low loan rates brokers have become experts at ensuring their loans are repaid. They accomplish this goal in large part by requiring that the loan be collaterlized by the securities purchased using the loan. Moreover - similar to a home mortgage - the broker will not lend you the entire amount of the purchase price. Instead, a hefty down payment is required. This down payment is known as the margin requirement. The margin requirement must be held in your brokerage account prior to making the purchase. The loan amount which must be repaid when the securities are sold. The loan value remains constant throughout the life of the investment. The net equity is the value of the securities minus the the value of the loan. At the time you make the initial purchase, the net equity will equal the margin requirement. The net equity value fluctuates constantly as security prices fluctuate in the market. The situation can be visualized in the first slice of Figure 1 below. It may be evident at this point that the margin requirement is there to ensure that net equity will be positive from the start. It acts as a buffer thereby reducing the risk that a loss will be incurred by the broker should the value of the securities fall. Before continuing it's important to understand the terms of the margin loan. With a home mortgage loan, compliance is maintained by making the scheduled payments on time. In contrast, a margin loan is based not on your ability to pay the financing fee, but rather, on the value of the asset relative to your net equity. We'll get into this in more detail later, but the key takeaway here is that the value of the asset is the main factor in determining if you are in compliance. It should be also noted that a margin loan does not have any stated maturity date. The loan is simply repaid when the securities are sold. Now, as we all know stock prices fluctuate from day-to-day, hour-to-hour, tick-to-tick and therefore the broker offering the margin loan must constantly monitor prices to ensure that the repayment of their loan isn't at risk. If the value of the security dips below a certain threshold, the loan amount becomes too great a proportion of the overall value of the security and the broker will call in your loan by forcing you to sell the security. This brings us to two related concepts. The first concept is that of initial margin. Initial margin is the amount that must be posted as a down payment when the asset is first purchased. The initial margin is quoted as a percent of the asset value (such as 50%). Let's use an example to illustrate the point. Say we want to buy $100 worth of Wal-Mart stock on margin. If the initial margin is 50% then we will need to have at least $50 in cash in our brokerage account. The broker will then lend us the additional $50 needed to acquire the $100 worth of Wal-Mart stock. Continuing our example, suppose that after we bought Wal-Mart stock on margin Wal-Mart stock drops in value to $80. The $50 loan then represents a greater proportion of the asset value ($50 loan value + $30 net equity value = $80 asset value). 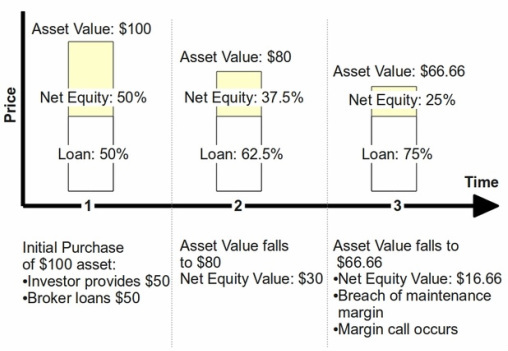 It went from 50% of the value ($50 loan value / $100 asset value = 50%) to 62.5% ($50 loan value / $80 asset value = 62.5%) of the asset value. If Wal-Mart stock continues to fall in price then at what threshold will our broker become concerned for the safety of his loan? This brings us to the second concept: maintenance margin. Maintenance margin is the threshold at which the broker will require additional collateral to be posted to the account or alternatively, liquidation of the position. Maintenance margin is also quoted as a percent of the value of the asset (i.e. net equity value / asset value). Getting back to our example, if the maintenance margin is 25%, then our Wal-Mart position must fall below $66.66 for a breach in maintenance margin to occur. $66.66 is arrived at by taking the $16.66 in net equity value and dividing by the $66.66 asset value (i.e. $16.66/$66.66 = 25%). Once the $66.66 value is breached the broker will issue what is known as a margin call. A margin call is simply a request issued to you from your broker telling you to either post additional collateral or liquidate the position. Traditionally, this request came in the form a phone call (hence the name margin call), but nowadays it usually comes in the form of an email. The timeline from initial purchase to the margin call is illustrated in Figure 1 above. Receiving a margin call is never a fun experience as it invariably means that the position has lost money. Figure 2 shows an example warning email from Interactive Brokers indicating a margin call may occur shortly. If the warning email is ignored and the asset continues to decline in value your position will be subject to liquidation by the broker. 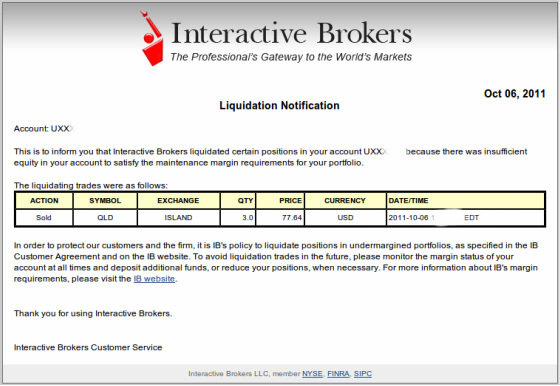 Figure 3 shows an example liquidation notice from Interactive Brokers. As you can see, a liquidation notification is simply the broker informing you that they closed your position. Investors who experience liquidations are often upset at how swiftly it occurs and/or that the broker gave them very little time to add collateral to their account. Keep in mind that the broker is simply protecting their loan. Moreover, the maintenance margin and the initial margin are not set by the broker, but by Federal securities regulations. Your broker has no choice but to liquidate your positions in order for to comply with Federal law. The next section discusses this in more detail. Ben Bernanke and the Federal Reserve regulate margin requirements for US brokerage accounts. Other regulators such as the SEC and FINRA are also involved. Securities margin in the United States is governed by the US Federal Reserve, the SEC and FINRA. Yep, you guessed it...Ben Bernanke and the other regulators dictate how much you can borrow from your broker. Federal controls on margin were enacted in response to the Great Stock Market Crash of 1929. Prior to the crash, investors were allowed to borrow as much as their brokers were willing to lend them. This often meant that the margin loan would represent up to 80% or more of the value of the securities. With Wall St. firms lending enormous amounts to investors, a speculative bubble emerged as the public piled into the booming bull market of the 1920's. When the crash inevitably happened, a huge number of investors were completely wiped out. To prevent the type of excessive borrowing that contributed to the bubble (and the subsequent crash in 1929), the regulators enacted strict limits on margin buying. The Securities and Exchange Act of 1934 granted the power to regulate credit in the purchase of securities to the Federal Reserve Board. The theory the Fed was going on was that by setting federaly mandated margin requirements, the aggregate amount of debt used by investors would be limited. In turn, this would reduce the occurance of debt fueled speculative bubbles, as well as prevent individual investors from being wiped out in the event of sharp market downturns. The requirements above are for equities. Other securities such as options have more complex, rules based margin. Lastly, Reg T gives your broker the authority to liquidate your position once a margin violation occurs. Without much fanfare these strict controls on margin changed significantly in 2007. A new breed of risk-based margining regulations was approved by the US Securities & Exchange Commission. While Reg T is still the de facto standard governing margin accounts, brokers are now allowed to offer sophisticated clients a significantly more flexible type of margin known as Portfolio Margin. Portfolio Margin usually results in much lower margin requirements and will allow retail investors to engage in investment strategies that were previously only available to institutional investors. A margin account allows an investor to borrow money from a broker in order to purchase an asset. The initial margin is 50% and the maintenance margin is 25%. This means that an investor can borrow up to 50% of the value of the asset at the time of purchase and the loan must not be worth more than 75% of the asset at any time. If the asset falls in value and breaches the maintenance margin requirement then the broker will eventually liquidate the position. The margin requirements are dictated by US Federal Reserve. In 2007, a new type of margin called Portfolio Margin became available to qualified investors.